The ‘seven species’ are the sacred grains and fruits that for the ancient Israelites were staples of their diet. The people of Israel were primarily farmers and shepherds, who saw the fruits and grains of the land as gifts from God. These farmers dedicated their lives to growing and harvesting wheat, barley, grapes, figs, pomegranates, olives and dates. These crops are known as the sheva minum—the seven species of Israel. People of the Jewish faith today can trace their cultural roots back through the rich history of Israel. Many of the Jewish holidays celebrated today originated from the agricultural lifestyle of Israel’s ancient people. Shavuot, “Pentecost,” in modern times, is a celebration of the day that God bestowed the Torah to the nation of Israel. But originally it was a summer harvest festival of the Canaanites, the first people of Israel during the Bronze Age. The Canaanites held this festival to rejoice in their bounty of wheat. The festival changed in the seventh and eighth centuries BCE, when the tribes of the land were united under one king and the Temple in Jerusalem. During this time Shavuot was a branch of Pesach, “Passover” (the planting season), which was the first of the two harvest holidays. Shavuot begins forty-nine days after Passover. This forty-nine day period is called the counting down of the omer (a unit of measure). On the second day of Passover, an omer of barley was brought to the Temple as a grain offering—an offering of worship. Different loaves of bread were made during each holiday. During Passover, unleavened bread (a bread baked without yeast) made from barley, was consumed. Likewise, during Shavuot, the people enjoyed bread that was made from fermented wheat flour. Sukkot, the “Feast of The Tabernacles,” is the seventh festival given to Israel. There are several customs tied to this festival, one of them involves the “four species,” one of which is the date palm, which is also one of the sacred seven species. There is then the etrog or “boughs of thick trees,” branches of willow and myrtle. Leaves of the palm are used to bind the willow and myrtle branches together. The etrog is held in the left hand and the bundle of the other three species in the right. Together they are waved in a pattern: to the east, south, west, north, upward and downward. This is a symbol of God’s rule over nature. Another festival, Tu Bish’vat, was originally commemorated the rise of spring. Tu Bish’vat was an agricultural celebration with customs nearly identical to that of Passover. 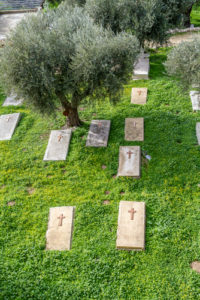 There is a version of this festival still being held today, but most Jews celebrate it by planting trees in the memory of family and dear friends. My Olive Tree is dedicated to replenishing the Holy Land of Israel. By planting the seven species of Israel, My Olive Tree will help this nation create economic stability through jobs and export products such as rich flavorful olive oil. The farming of these trees and grains instills a communal bond in the people of this land through a strong connection to their ancient heritage.